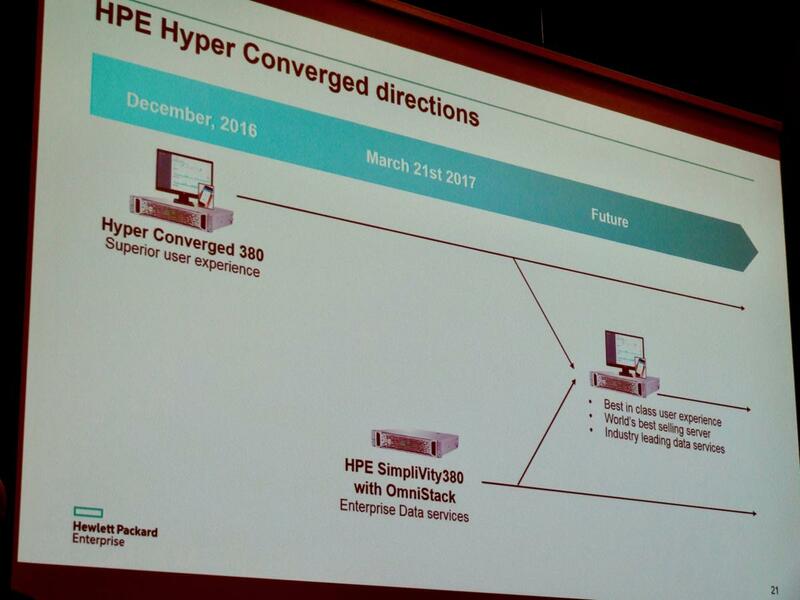 SimpliVity’s hyperconverged infrastructure appliance, the OmniCube, replaces storage switches, cloud gateways, high-availability shared storage, and appliances for backup and deduplication, WAN optimization, and storage caching. The company also offers OmniStack, the software powering the OmniCube, packaged for other vendors’ hardware. Three versions of the SimpliVity 380 are available, with five, nine or 12 SSDs of a capacity of 1.9 terabytes each. The servers have dual Intel E5-2600 v4 (Broadwell) processors, and customers can configure them with up to 44 cores. Depending on how much RAM is ordered, usable memory will range from about 140 GB to 1.4 TB. Depending on the configuration requested by the customer, the total cost will vary between $26,000 and $100,000, an HPE spokesman said. This story has been corrected to give the correct capacity for the SSDs in the eighth paragraph.